Deutschbrasilianer or Deutschbrasilianisch (in German), teuto-brasileiro or germano-brasileiro (in Portuguese) or German-Brazilian (in English) basically is a Brazilian person of German origin / ancestry (i.e. with ties with that language, one of its dialect, the German nationality, that place of origin and who is native to southern Brazil (and to some extent also existent in some other regions of the country, like in the state of São Paulo, Rio de Janeiro, Espírito Santo, etc...) However, most German-Brazilians do live in the southernmost states of Brazil, namely in Rio Grande do Sul, Santa Catarina and Paraná. Strong influence from German immigrants in Blumenau, Southern Brazil. There are no trustworthy sources as of the exact number of German-Brazilians in existence today. However, most estimates indicate that around 10 million Brazilians have German ancestry . The largest concentrations of people of Germanic origin in Brazil are found in the states of Santa Catarina (35% Germanic) and Rio Grande do Sul (30% Germanic). The percentages become higher in some cities, for example, in the town of Pomerode, in Santa Catarina, 90% of the population are Brazilians of German descent, and the main local language is Pomeranian dialect. It is considered the most German city in Brazil. Many towns in Southern Brazil have a majority of German descended people, such as São Leopoldo, Novo Hamburgo, Nova Petrópolis, São Bento do Sul , Blumenau, Joinville, Santa Isabel, Gramado, Canela, Santa Cruz do Sul, Estância Velha, Ivoti, Dois Irmãos, Morro Reuter, Santa Maria do Herval, Presidente Lucena, Picada Café, Santo Ângelo, Teutônia, Brusque and many others. 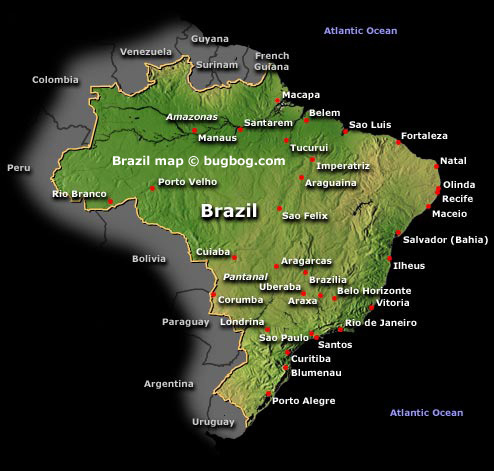 Brazil is the largest country of South America. Population is approximately 160 million, the capital is Brasilia.